MELHOR LOCALIZAÇÃO NA CIDADE! APENAS FORA DA RUA PRINCIPAL - PASSE A GONDOLA E RESTAURANTES! O piso principal tem uma grande sala com uma enorme lareira fabuloso adjacente a uma grande sala de jantar, que fica ao lado da cozinha. O piso principal também tem três quartos, dois quartos king size com casa de banho privativa, bem como uma dupla quarto duplo. A banheira de hidromassagem e jardim de inverno sala de bilhar (provavelmente frio no inverno) sentar-se fora do piso principal. O piso térreo contém um quarto de casal com casa de banho entrou pela sala de beliche (dorme 7), também com a sua própria casa de banho. Acomoda 15 em camas. This house is very good for large groups to gather. The location is within walking distance to town and the gondola. The owners were quick to respond and remedy the two issues we experienced on the first day. I only have a couple of things that kept me from rating this home a five. First, my group goes to a different ski resort every year for a week and this is the first time we have ever stayed in a property that advertises a fireplace, but does not provide any firewood. The owners suggest you get your firewood from the local market, but buying wood in small bundles isn't economical and if you don't have a vehicle it will be quite a lot of physical labor to get enough wood to the house. In the evenings, we love having a nice fire while we sit around and it just wasn't possible this year. It was quite a disappointment. Maybe no houses provide wood in Breckenridge, but this hasn't been our experience at other ski resorts when you’re staying in homes at this price point. Additionally, while there are lots of pots and pans, some of the pans were unusable due to the non-stick coatings being so torn up. They were very disgusting looking. We managed to find one large high side pan and one very small pan that were in good condition and since we only cooked breakfast a few days we managed. If your group plans to cook a lot, I think it would be a bigger issue. Lastly, there was an outside pole light between the garage and street that started flickering at night the last two nights we stayed. It was very difficult for the couple in the king bedroom facing the street to get to sleep with the light flickering every few minutes. We couldn't find a switch that controlled this light, so we couldn't turn it off. We assumed the light was controlled by a sensor to turn on when it became dark. Beautiful mountain lodge home with lots of room for a big family! 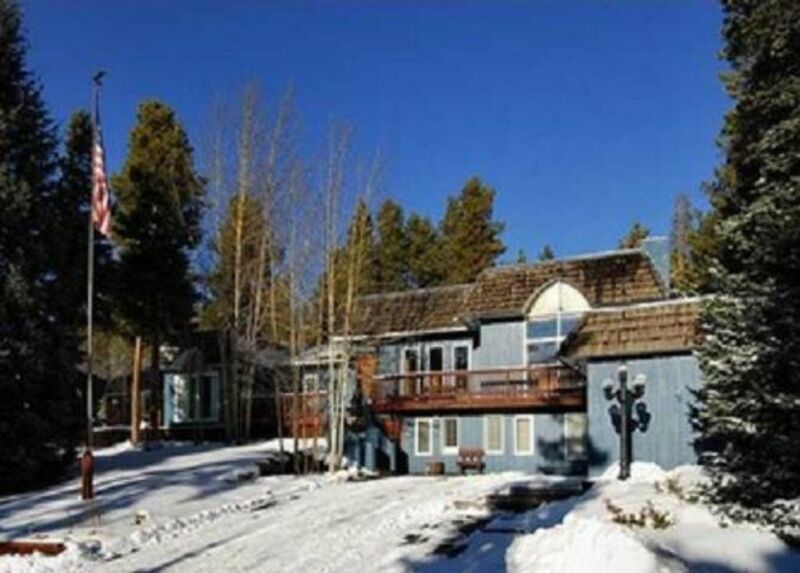 We loved the house and the location, within easy walking distance of Breckenridge downtown. Great for families with small children. Great kitchen for cooking big family meals. Beautiful views of mountains. Mountain lodge feel with lots of rustic charm and warmth. House as described. Great location. Comfortable for four adult couples. Bunk room useful for single add-ons or children. Short walk to the Gondola or Main Street. Cable service is only standard definition, recommend packing a Roku/AppleTV/Etc. No bath supplies or dishwasher detergent was a slight inconvenience. Overall a good option if you have a large group and don’t want to rely on driving after arrival. I had a group of people from Oklahoma for a ski trip. 75% skied, and the rest enjoyed their time in the home and the surrounding area. The location is idea, and the home is comfortable. Great House, Great Location, Great Owner! We brought a large group for an annual ski trip and this place easily exceeded our expectations. We had 14 adults in our group and the house never felt cramped or crowded. Any amenity we needed was available, including a fully equipped kitchen. We were easily able to cook for our large group. We had skiers of all different levels and the location allowed people to come and go as they pleased. You'll be hard pressed to find a better location with a more responsive owner.